You’ve probably already recognised what type of object I’m showing you today. 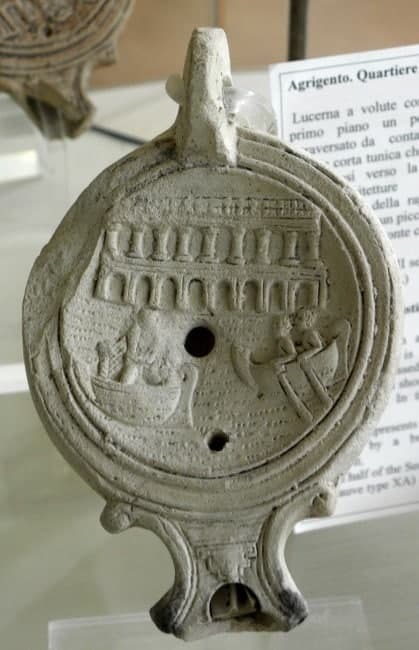 It’s an oil lamp, dated to between AD 150 and 200, and found at Agrigento, ancient Akragas (Greek) or Agrigentum (Latin), near the southern coast of Sicily. It is decorated with a scene of three fisherman in two boats, in front of a backdrop of monumental architecture. The scene is visible clearly enough, but quite rough in execution. Oil lamps are very common finds on archaeological sites from all phases of Greek and Roman antiquity and beyond. They were simple objects, normally relatively small, usually mass produced and thus inexpensive, and serving a function that made them a necessity for virtually everyone: to provide light. As a result, they have been discovered in enormous numbers in all kinds of contexts: private homes, fortifications, shrines, public buildings, graves. Oil lamps go back to the Bronze Age or before. The conventional Roman oil lamp, developed from Hellenistic and other precedents and standardised by the 2nd century BC, did not change much for hundreds of years, making it one of the most recognisable Roman artefacts. 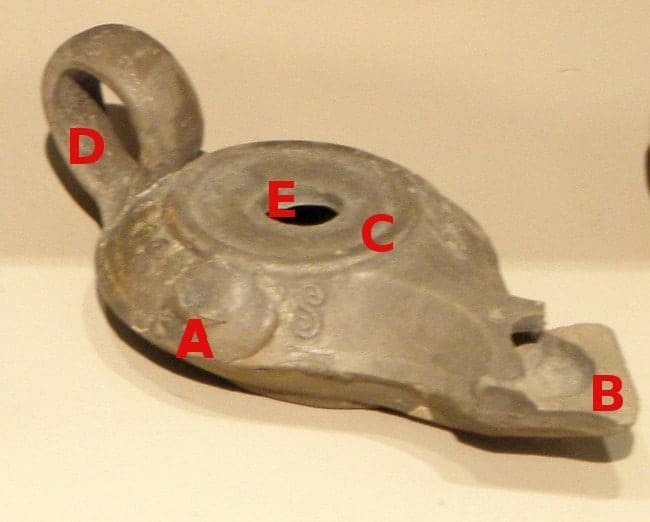 An early 1st century BC oil lamp from the Antikythera Shipwreck, with the five main features indicated A-E. Most typically, it consists of four parts (A-D) and one feature (E). The reservoir (A) is a round or elongated shallow vessel, normally tapering to a more or less elongated spout or nozzle (B) with an opening for the wick; a flat circular disk-like top (C) covers the reservoir and nearly always a vertical handle (D) is attached at the back. The disk usually has a central hole for filling and cleaning (E), often accompanied by a smaller air hole. The function is easy to explain: flammable oil (usually some kind of plant oil) was poured into the lamp and a wick made of plant fibre was inserted at the tip. The latter could be lit and the object as a whole was thus a portable light source. Apart from these typical hand-held lamps, there were also hanging lamps, and larger non-portable lamps to be set on tables or in wall brackets. These were also often made of clay, but potentially also of materials like metal or even stone. A 2nd century AD Roman oil lamp from the Agora of Athens, depicting Leda’s encounter with Zeus disguised as a swan. As regards the lightweight portable clay oil lamp, many variations occur within the simplistic description given above: shape and size can differ, multiple wicks or multiple handles might occur, and the lamps might bear various form of decoration. They often do, virtually always in the form of a circular medallion (or tondo) on the central surface of the disk. From the Hellenistic period onwards, such decorations were most commonly in the form of shallow reliefs, made in a mould of clay or perhaps wood, permitting the industrial mass-production of the same lamp motifs in the hundreds or even thousands. 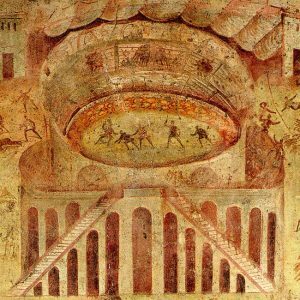 The motifs on such lamps range between quite a few different types of subjects, including myth and religion, scenes of theatre or the arena, erotica, scenes from daily life and “genre scenes”, i.e. set-pieces from various contexts. Our lamp is one of the latter. Harbour scenes appear to be a speciality of two production centres: Carthage in what is now Tunisia and Alexandria in Egypt, both of them harbour cities of immense importance and fame in Mediterranean trade, and both of them key harbours bringing grain to Imperial Rome. They are probably meant to “portray” the harbour in question, but as they are cheaply produced daily-use objects, they do so casually and generally. Our piece ought to be from Carthage, because we know the type and also because of geography: Carthage is only 350km (210mi) by sea from Agrigento. The central motif of our Agrigento lamp: two small fishing boats in the water (indicated by incised or moulded dots), one occupied by a single fisherman, the other by two rowers, in front of a monumental architectural backdrop, perhaps portraying the harbour of Carthage. 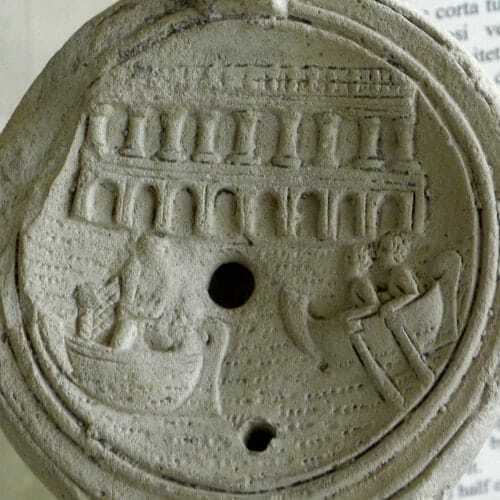 We have no specific idea why a household in Roman Agrigentum would use an oil lamp with that motif. The possibilities are endless, as they are for all oil lamps with images: maybe the buyer chose a motif according to their interests, desires or predilections (more likely), or maybe they went for whatever was available (much less likely – as it does not explain the effort involved in producing such a great range of imagery on those objects). It is also difficult to explain why oil lamps would travel at all – after all they could be easily produced locally and were indeed made pretty much anywhere. 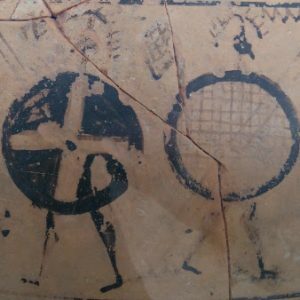 Perhaps they travelled as a by-load with more important produce (like grain or oil), or maybe they were seen as “exotic” objects, advertising the user’s real connections with a wider world or satisfying his or her liking for that idea. In any case, our Agrigento oil lamp is a fine and interesting object, and one of many starting points for investigating such seemingly run-of-the-mill items. 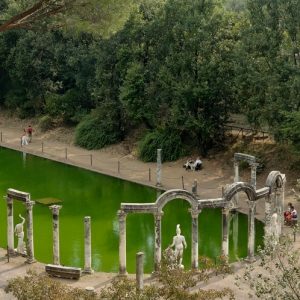 Its motif expresses a deliberate meaning, be at a souvenir, an advertisement, or an expression of the “mare nostrum” (“our sea”) that the Mediterranean had become during the apogee of the Roman Empire. The stamped scene on its disk expressed some meaning – ever so fleetingly – highlighted by the light and shade from the flame at its very own spout. 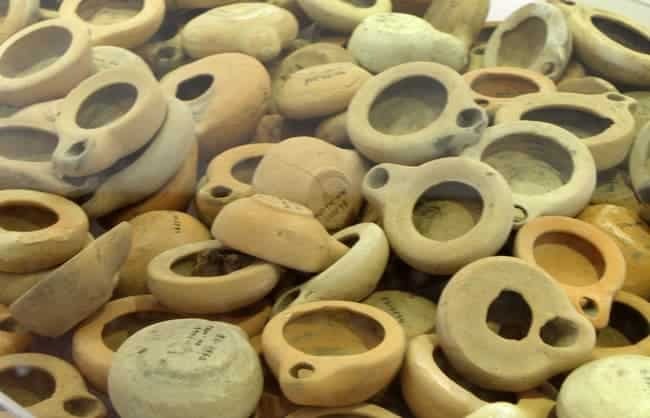 Really not rare: mass produced Hellenistic oil lamps (preceding the Roman type) in the museum at Morgantina on Sicily. The presence of this object in some home in Roman Agrigentum illustrates how the Rome’s sway over the Mediterranean made the world smaller in a way: such seemingly far-flung items occur throughout the Roman Empire, illustrating how the “wider world” became part of daily life even for the less affluent parts of the population. Oil lamps are omnipresent in archaeological museums around the Mediterranean Sea. We see them on all of our escorted tours, and often they give us a story to tell and questions to ask. So, you can engage with that type of visual imagery and practical object while travelling with us, with our experts embedding the individual artefact in a broader story of ancient life, or you can do so in a museum nearer home. You should do both!